At the harsh pace of modern life, we often lack the time and energy to engage in a healthy lifestyle. But each and every one of us wants to feel great and stay in good shape. The Vita Energy Shake is made for all those smart people who choose to pursue health, wellness, and a happy life. These tropical-flavoured shake will bring some fruity goodness into your high-protein meal plan. Ingredients: Whey protein concentrate (from milk), Soy protein isolate, dietary fiber (acacia gum, inulin), Soy bean oil, Milk protein isolate (from milk), flavour (goji berry flavour), thickening agent (guar gum, xanthan gum), maltodextrin, colorant (beet root red), minerals (potassium citrate, magnesium carbonate, calcium carbonate, iron (II) sulfate, zinc sulfate, potassium iodide, sodium hydrogen selenite, copper (II) gluconate, manganese sulfate), goji berry extract powder. Vitamins: (vitamin E (dl-alpha- tocopheryl acetate), vitamin C (L- ascorbic acid), niacin (nicotinamide), vitamin A (retinyl acetate), biotin (d -biotin), pantothenic acid (calcium d- pantothenate), folic acid (pteroylmonoglutamic acid), vitamin B12 (cyanocobalamin), vitamin B2 (riboflavin), vitamin B6 (pyridoxine hydrochloride), vitamin D3 (cholecalciferol), vitamin B1 (thiamine mononitrate)), sweetener (sucralose). 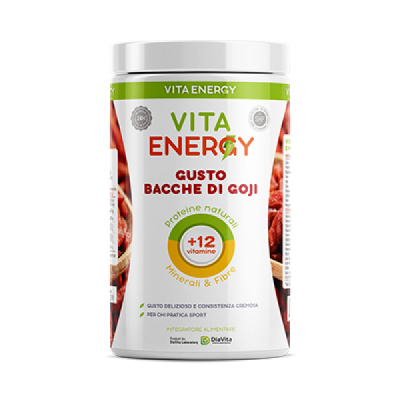 Directions for use: We recommend consuming Vita Energy shakes daily for breakfast as well as 3 hours before sleep. Mix 1 scoop (32g) of Vita Energy with 250 ml (1 1/2 cups) cold water, juice or milk*. For thicker, creamier shakes, use a blender and mix for 30-40 seconds. As a meal replacement, men and women should take 2 servings daily. Allergen information: *People with individual intolerance to the components of the product should consume it cautiously. Not recommended if you are lactose intolerant. Made in a facility that processes eggs and nuts.